Kashmir, popularly called Heaven on Indian Earth, is nowadays burning up as if it’s hell. Though the problem of Kashmir is six decades old, it often gets so violent and disturbing that the Indian government finds it very difficult to handle. Two years ago a similar kind of turmoil happened on the issue of land allotment to the holy Amarnath Shrine. At that time it seemed that finally, this problem would take a decisive turn, but it seems as if today people might have forgotten about it. 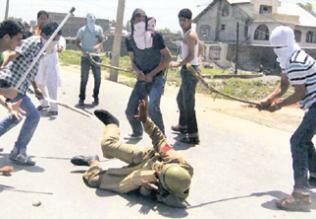 The Kashmir valley is once again face to face with violence that has been happening since June 11. The last two months Kashmiri youth began pelting stones at the security forces in a planned way. India considers Kashmir as an integral part of itself, whereas Kashmir-based secessionists, mainly the Hurriyat Conference extremist leaders have different views on Kashmir. Some secessionists call for Kashmir’s freedom whereas some opine that it should be integrated with Pakistan. Some are of the view that both parts of Kashmir should be merged and be recognized as an independent nation. Periodic violent incidents in the usually calm Kashmir renew the political grievances and unemployed Kashmiri youth easily become a tool in the hands of the secessionist powers, as is clear from the present situation. Pakistan is in the search of such circumstances in the hope of destabilizing Kashmir. There are also reports that Pakistan’s ISI has a major role in current disturbances in Kashmir and secessionists leaders in Kashmir, especially Syed Ali Shah Geelani are its pawns. This is paradoxical that while on the one hand Geelani is appealing to Kashmiri youth to restrain from stone pelting and at the same time he is making an ’emotional’ appeal to the same youth to participate in violent protests in large numbers so as to achieve ‘freedom’. When the security forces react to disperse people, a kid or youth gets killed by a police bullet. After that he is treated as a ‘martyr’ for the cause of Kashmir’s freedom and his last journey is given a violent touch. And this situation further messes up the situation. Protests are not limited to stone pelting, in fact according to the Home Minister P Chidambaram; many armed youth also remain present in these protest rallies. State politics are no less responsible for the current turmoil in Kashmir. Even though Omar Abdullah was made the Chief Minister of J&K, by apparently a fully democratic process, many veteran leaders of the state are not ready to accept him as the head of the state. Particularly, the main opposition is the People’s Democratic Party (PDP) who seems more interested in destabilizing the state instead of cooperating with the government. Recently, on the suggestion of the Prime Minister Dr. Manmohan Singh, Omar Abdullah called an all party meeting in order to restore peace in the state. PDP was also invited but it did not join. Instead its leaders continued to give poisonous statements regarding those killed in police firing. The same game is being played by the Hurriyat Conference which avoids participating in the state’s democratic process. Even their repeated calls for an election boycott are rejected by the people every time. One thing is clear. Whether it is an attempt by the PDP to weaken the Omar Abdullah government, or an effort to misguide youth by the Hurriyat leaders like Geelani, ultimately those youth are getting injured or killed who are victims of such political propaganda. Security forces are also paying for this in the course of doing their duty. Kashmiri youth should follow the following lines of the poet: Ameer-e-Shaher gharibon ko loot leta hai, kabhi ba-heel-a-e-mazhab kabhi banaam-e-watan. It means that the secessionists are only trying to capture power by misguiding youth either in the name of ‘freedom’ or religion. Instead of listening to people like Geelani or religious fanatics, our Kashmiri youth should get inspired by Kashmiri youth Shah Faisal who, by topping the Civil Services Examination in 2009, has done well to the name of Kashmir as well as to Indian Muslims. What type of independent country are the secessionists imagining? Are they not learning anything from the internal situation of Pakistan? Are they not aware of the economic and psychological state of the people of Pakistan and Pak Occupied Kashmir? In fact, some people, by misguiding the Kashmiri youth in the name of religion and independence want to convert this heaven (Kashmir) on earth into a hell state like Afghanistan. Their claim of preserving Kashmiriyat is also fake. Otherwise, thousands of non-Muslim Kashmiris would not have been forced to leave Kashmir by these forces. Without these non-Muslim Kashmiris, the true Kashmiriyat is incomplete. Kashmiri youth should remain alert from such actions of these secessionists. They should also think about the tourism potential Kashmir (including POK) holds. It would have been much better, had these separatists launched a movement with Kashmiri youth for inclusion of POK in the Indian boundary and thus unification of this heaven on Earth so that the people of POK can also become economically strong and make their place a tourist hotspot like the Heaven on Indian Earth “Indian Kashmir” was.